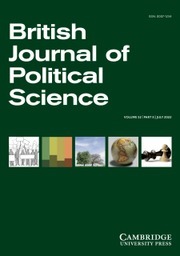 The British Journal of Political Science (BJPolS) is a broadly based journal aiming to cover developments across a wide range of countries and specialisms. Contributions are drawn from all fields of political science (including political theory, political behaviour, public policy and international relations), and articles from scholars in related disciplines (sociology, social psychology, economics and philosophy) appear frequently. With a reputation established over 40 years of publication, the BJPolS is widely recognised as one of the premier journals in its field.